I just gave a talk on ‘Building Strong Marriages’ and am inspired to blog on MARRIAGE for the month of April. 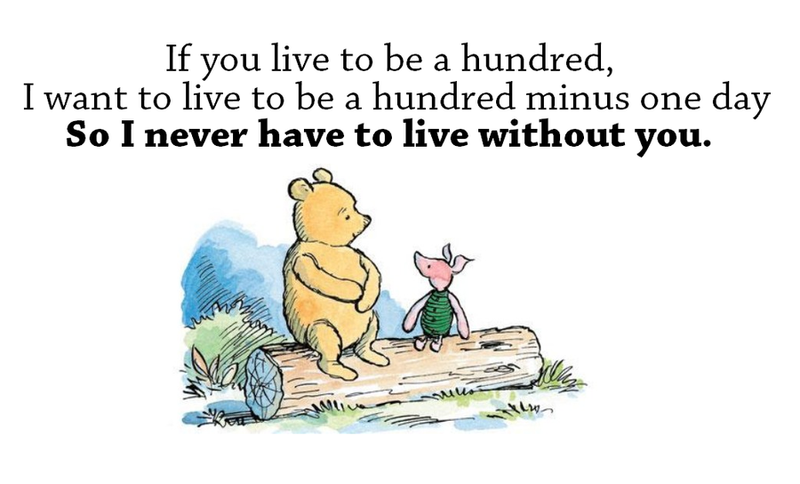 I like to be able to say the same as Winnie the Pooh in my marriage – to have a long and strong marriage with my husband to the very last day of our lives. How do we have a strong marriage? To have a strong marriage, get better at cultivating compatibility, communicating positively and constructively solving problems. A strong marriage has enthusiasm and energy, an article in PREPARE (a premarital program) wrote. To be enthusiastic is to be full of God, to be energised and inspired by God. Enthusiasm is attractive and it exudes energy. People love to be around enthusiastic people as their moods are altered when they are in a highly charged positive atmosphere. You can use Peter Scazzero’s emotional thermometer to practise being enthusiastic . Enthusiasm is heightened when there is appreciation and excitement . The greatest joy of connecting with our significant other is to be ENCOURAGED in the attachment. Paul the Apostle wrote in Col 2:2 that the main goal in relationships, including marriage, is to be knit together by strong ties of love and to be encouraged in heart and united in love. When we are encouraging, we will increase compatibility. Don’t depreciate marriage life by counting things that are wrong. Don’t be a fault finder and have stinking thinking. You will create a negative atmosphere and no one likes being at home. Get better at positive talk and your compatibility level will rise.